The UC Santa Cruz Satellite Reef is on display at the Seymour Marine Discovery Center from May - November 2017. The UC Santa Cruz Satellite Reef is part of the Crochet Coral Reef world-wide reefing project (2005–present). 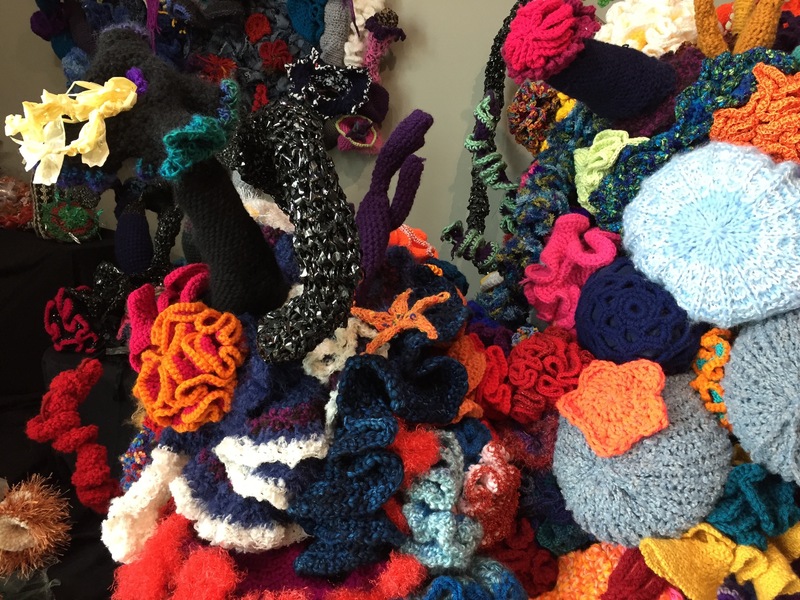 Created by sisters Margaret and Christine Wertheim of the Institute For Figuring, the Crochet Coral Reef ​resides at the intersection of mathematics, marine biology, handicraft and community art practice. The project is a spectacularly beautiful, artistically complex, and socially powerful way to bring people together around a devastating ecological challenge—the survival of the coral reefs and marine ecologies throughout the world. 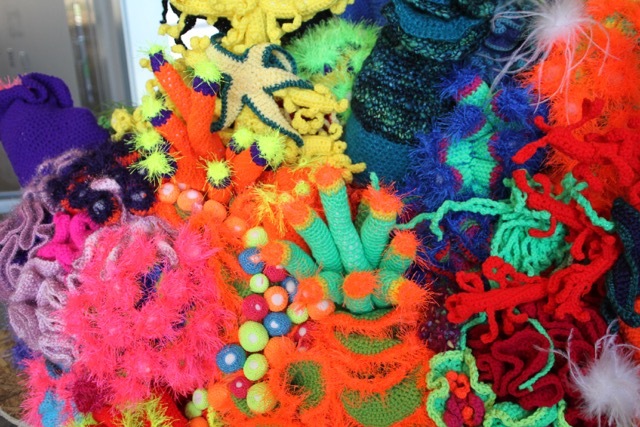 Crochet Coral Reef installations have been exhibited in art and science museums worldwide, including the Andy Warhol Museum (Pittsburgh), the Hayward Gallery (London), the Science Gallery (Dublin), and the Smithsonian's National Museum of Natural History (Washington D.C.). 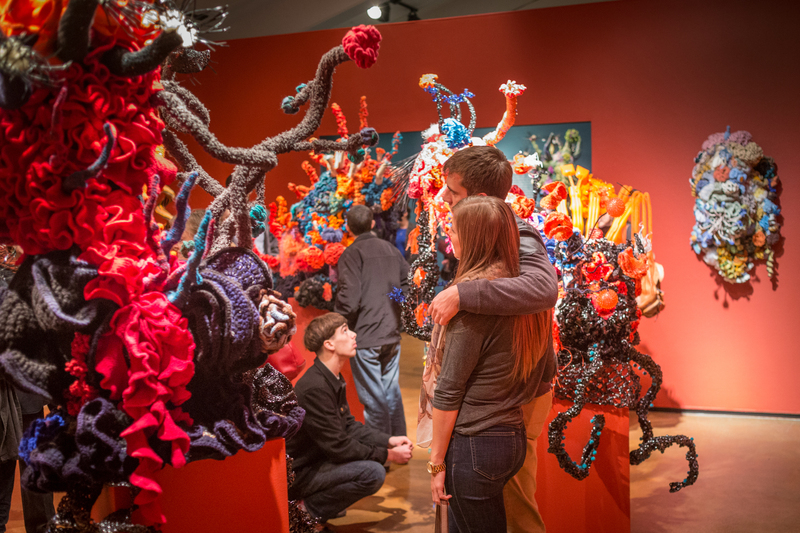 Seen by more than three million people, the Crochet Coral Reef is now one of the largest participatory science + art endeavors in the world. The UC Santa Cruz Satellite Reef is the latest whimsical and fantastical addition to the Satellite Reef Program. Through this program, the Institute For Figuring team holds workshops and lectures to teach the techniques of reef-making – plus the related science and mathematics – to local communities. Since 2005, the IFF has been actively building this global network that currently includes some 8000 citizens in a dozen countries as a response to the environmental crisis of global warming and the escalating disaster of the mass world-wide bleaching of coral reefs. The Institute of the Arts and Sciences (IAS) was drawn to the UC Santa Cruz Satellite Reef because of how the project intersects with the central mission of the IAS: to bring to bear the creative power of the arts and the sciences on the most critical issues of our time. As Rachel Nelson, co-curator of the UC Santa Cruz Satellite Reef says, "With the Satellite Reef project, the Wertheim sisters have developed a project which enlists people to collectively consider how we are entangled into climate change. 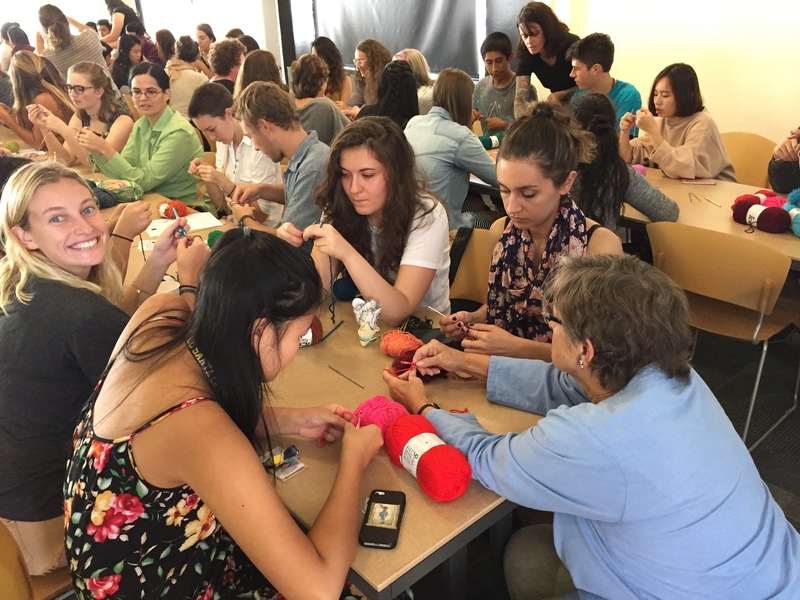 Using colorful yarn, crochet hooks, and the principles of hyperbolic geometry, the project allows communities to creatively learn about and emulate the intricate balance of life forms and collaborative processes that compose the ecosystems of coral reefs." Co-curator Alex Moore adds, "this combination of science instruction, geometry, and craft work has a deep sense of purpose. Everyone who crocheted somehow brought a little of the underwater realm into their own ecosystem." 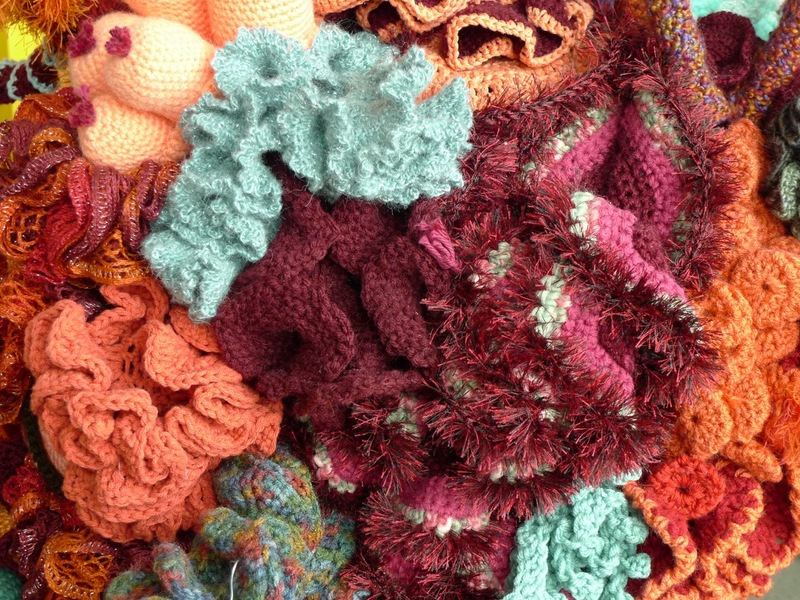 One stitch at a time, Crochet Coral Reef proposes ways for humans to differently conceive of ––and act on–– their relationships with oceans and reefs, the planet, and even each other. 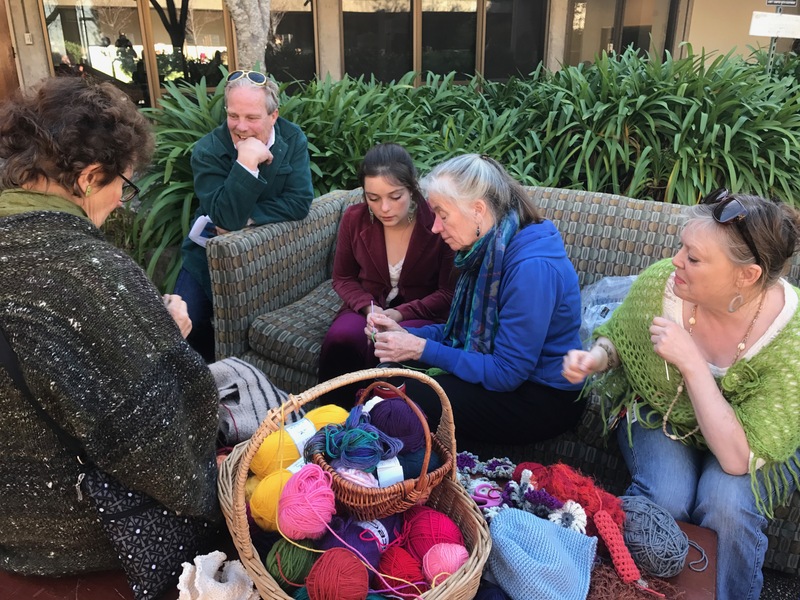 The participatory aspects of the UC Santa Cruz Satellite Reef reflects another one of the core missions of the IAS: to utilize arts programming and exhibition making to strengthen the UCSC community and to build bonds with the larger communities it is enmeshed in. 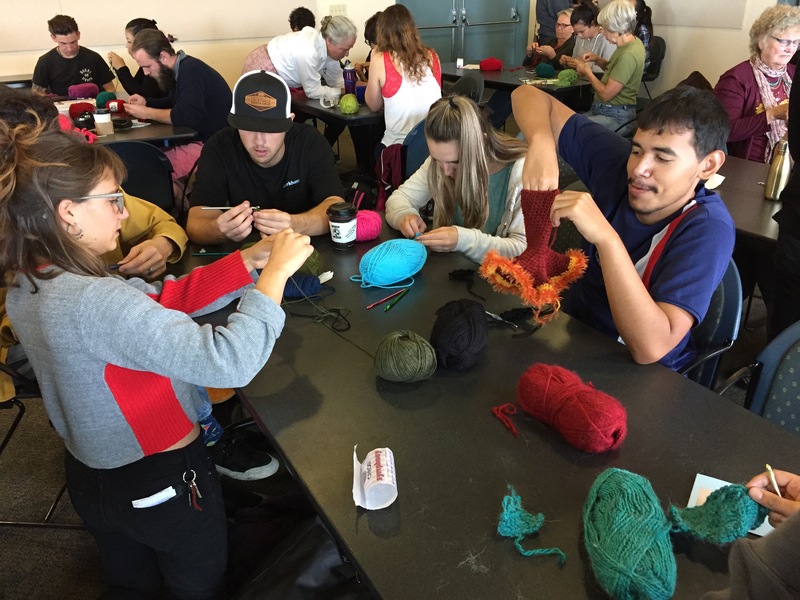 For the UC Santa Cruz Satellite Reef, hundreds of UCSC students, faculty, and staff stitched alongside community members from across Santa Cruz County to raise awareness about ocean health. 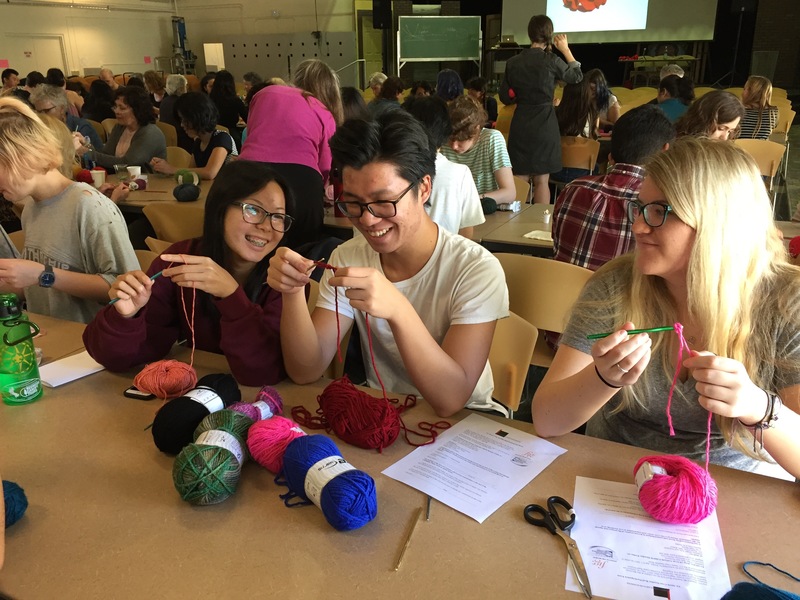 IAS student intern Lucy Ashton explains, "students had the special experience of getting to know community members and build relationship and connections that probably would not have happened if it were not for the medium of crochet." The exhibition of the UC Santa Cruz Satellite Reef is at the Seymour Marine Discovery Center (SMDC) through November 2017. The SMDC is a public, self-supported facility at UCSC dedicated to educating people about the role scientific research plays in the understanding and conservation of the world’s oceans. Surrounded by marine life, stunning views of Monterey Bay, and fascinating displays about ocean research at the SMDC, the UC Santa Cruz Satellite Reef is truly in its element. The playful crochet critters, strange and towering environs, and abundant handcrafted flights of fancy come to life amidst the exhibitions of the SMDC, showing how fascinating and enriching the arts and sciences can be when combined. 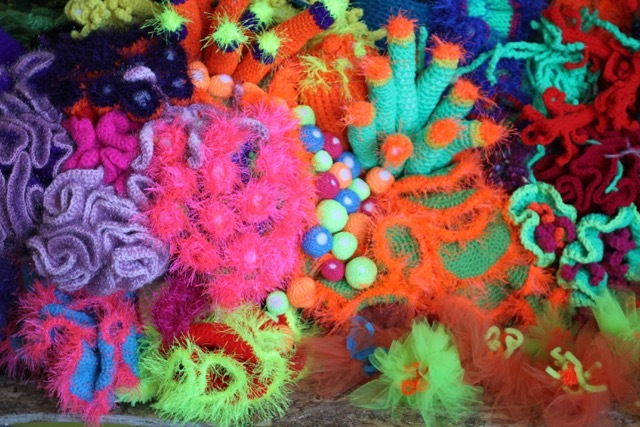 Click here for more information about the Crochet Coral Reef project and the Institute For Figuring, including how communities can get involved in the world-wide reefing efforts. The exhibition is collaboratively produced by the Institute of the Arts and Sciences and the Seymour Marine Discovery Center.